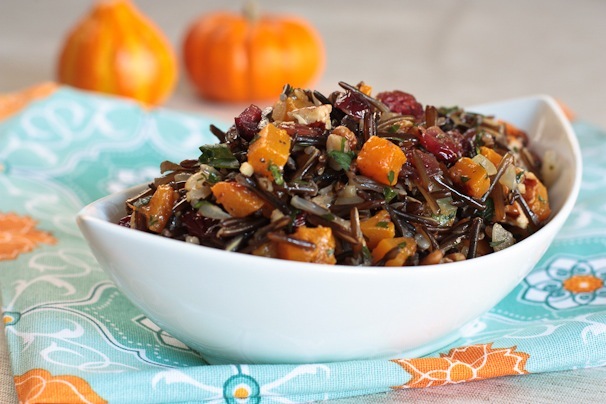 You can use all wild rice or a combination of wild with basmati, brown or red Bhutanese. 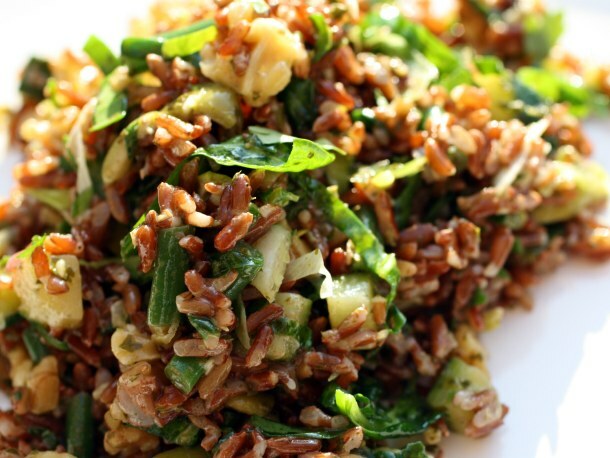 Lundberg mixed rice combinations are an excellent way to go. Heat oven to 400F. Toss the butternut squash with 1 tablespoon of olive oil, and sprinkle with salt and pepper. Spread the squash on a baking sheet. Roast until tender and starting to brown, about 20 minutes (check earlier if your pieces are very small). While the squash is roasting, heat 1 tablespoon of olive oil in a medium skillet. Sauté the onion and garlic for 3-4 minutes. Cook the rice according to package directions (I like to substitute vegetable broth for water). When the rice is cooked, transfer it to a large serving bowl. Add the sautéed onion and garlic. Place the dried cranberries in a bowl with the warm water and vinegar. Let sit for 10-15 minutes, then drain and add to the rice bowl. Add the parsley and pecans. In a medium bowl, whisk together the remaining olive oil, lemon zest, cumin, cardamom, cinnamon, orange juice, lemon juice and fresh ginger. Add it to the rice and mix well. Gently mix in the roasted squash. Adjust for salt and pepper. Serve warm if possible, or at room temperature. Serves 8. This is a decidedly grown-up version of red beans and rice – spicy and flavorful. For a less spicy version, use ham or kielbasa instead of the more authentic andouille. 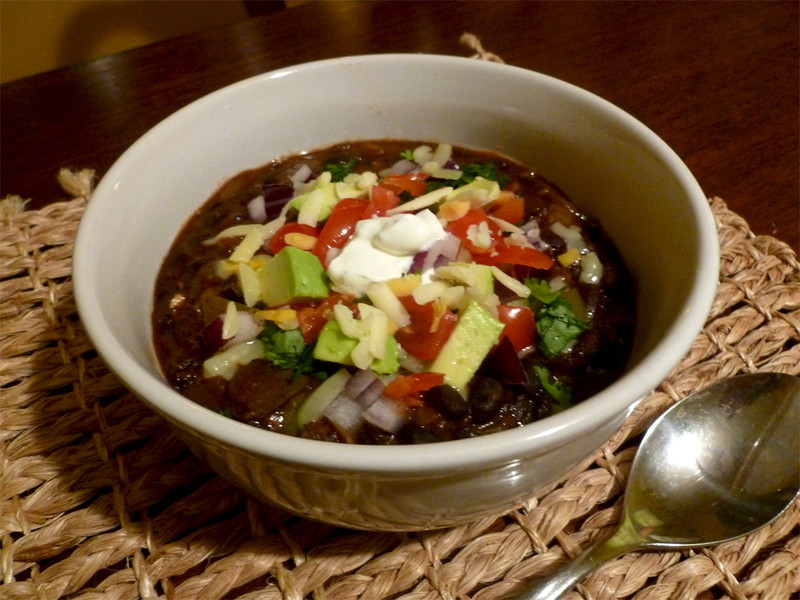 Like most bean dishes, this one tastes best if you cook up your own beans. The cooking time of dried beans varies widely, depending on how old the beans are and the variety. Anasazi beans cook quickly and do not require soaking beforehand. 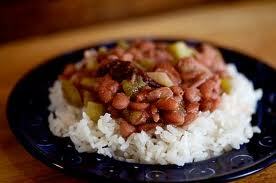 Red beans are slower and benefit from an overnight soak in cold water prior to cooking. This recipe is adapted from Fine Cooking. Serves six. Heat the oil in a Dutch oven over medium-high heat. Add the sausage and cook, stirring often, until browned, about 4 minutes. Stir in the celery, scallions, bell pepper, onion, the bay leaf, thyme, 1 tsp. salt, and 1/4 tsp. pepper and cook, stirring often, until the vegetables are softened, about 5 minutes. Add the garlic and cook, stirring constantly, until fragrant, about 1 minute. Add the cooked beans and ½ C liquid, reserving more as needed. Turn heat to low, cover, and simmer very gently 15 minutes to meld flavors, adding liquid as necessary to keep beans moist but not soupy. Discard the bay leaf from the beans, stir in the parsley, and season to taste with salt and hot pepper sauce. Serve the beans over the rice, with the hot pepper sauce and pickled jalapeños with their liquid on the side. COOKING THE BEANS: You may use canned beans, drain but do not rinse. Two cans will yield slightly less than four coups. Cooked dried beans produce better flavor and you can control the tenderness of the beans better. One pound will yield eight cups of cooked beans. To cook anasazi beans, simply place dried beans in water to cover, by about ½ inch; add three garlic cloves, ½ t each salt and pepper. 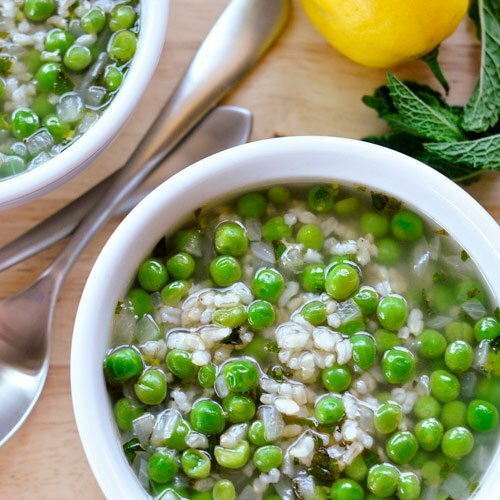 Bring water to a boil, reduce heat to a simmer and cover. Cook approximately 60 minutes until beans are soft but not mushy. Let them cool in the cooking liquid. Refrigerate until ready to use.